This is the new area I made last year in my back garden. Óoooh, lovely. Thank you Terratonie and wellcome back, we were missing these wonderful photos. Beautiful. What are those low blue flowers, please? Hi Katarina .. Thank you. The pretty purple/blue flowers are aubrieta. For how long does it bloom like this? That's very pretty TT. I like the texture the pebbles give the area. gorgeous Terra - this is how I wanted mine - great work!!! It takes a while for the new planting to settle. Katarina .. all the flowers in this photo bloom for many weeks. I'm glad you saved the frogs. Lol. Looks lovely , Tt ; I wondered where you had got to .... I was about to organise a search party ! I was encouraged back to GoY by a very good friend .. I am glad, as you have so beautiful corners in your garden to share. Glad you're back and that pebble border looks fantastic. Thanks Terra, yes good fun they are driving me nuts!!! Glad your youngsters are enjoying their chocolate.. Lol. Photos like this give us all inspiration to put more effort into our gardens. GOY would not be the same without Team Terra!!! Beverley ... Thanks ... your own garden border planting is very pretty. Neena ... Thank you. Very wet gardens today ! the curved shape is lovely and those white pebbles make it so light and bright. The Pebble Garden turned out better than I had imagined. 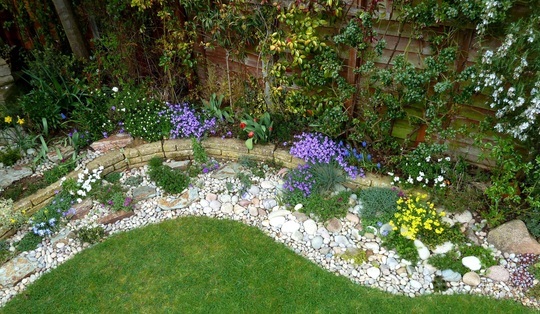 It ended up sort of a mix between a Pebble Garden and a Rockery.. a bit of a hybrid... Lol. I can see this from my back windows. To take this pic, I balanced on a plastic chair on the lawn. Wow what a beautiful area you have created. I feel quite inspired now! I love the aubretia... beautiful. It was a choice between the chair and extremely high-heeled wellies ;o) Lol. ... needed lots of wellies today in all the rain ! Just perfect, you must feel so proud of this. Thank you Homebird and Wildrose .. I'm pleased how well this area blends in with the rest of the garden. Not a weed in sight. Lovely. We are plagued with ground elder which flourishes at every opportunity! That must be very time-consuming and exhausting, trying to win the battle of the ground elder ! Still catching up, TT, your pebbles are lovely and so beautifully clean. A lovely area, just love it. Hi Terratoonie, Great area nice and bright with great planting. Reading threw your comments and the amount of comments you get, it shows how much people missed you and how well liked you are ! Thanks Linda and Bill for your lovely comments. I felt better for having taken a short break. The Pebble Garden has developed better than I had expected. Lol. Beautiful, there again i think all your garden is so lovely. Thanks. This area is much more rewarding to work on, now that it is a pebble garden.... I'm pleased I designed it, and changed it last year. This area has turned better than I had expected. Lol. I'm very pleased with this area.